Church of the Big Sky: Riverside F'ing Iowa! Haha, awesome. Can't wait to see the picture(s)! What a hilarious post! 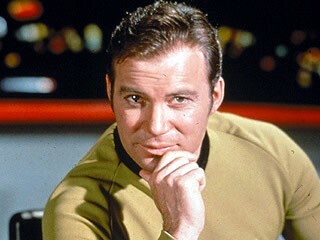 Gawd, I miss the Star Trek franchise, but LOVE what William Shatner's been doing lately. Can't wait to see the statue! P.S. I also love how you started and ended your audio post in Spanish! You're my favorite polyglot, you know that? I can't believe what I'm learning on this blog. Yes, please post many pictures of the statue! It's Friday now, so I hope you are/have made it back for the Trekfest. That sounds awesome. Maybe some congregation of Kirk worshippers will gather round the statue and display their Kirk-cult ways to outsiders for a day. I saw him at a con once- good times. Have fun! "I have a BOIL...the size of an APPle...on my THIGH...."
Ah, the salad days of "The Daily Show"... Although I can't say I miss Craiggers, I liked the questions bit. Knowing you were with family this week, when you started your post with your location my first thought was "Damn, she's from Kirk's hometown. How cool is that!" As someone who had a beach towel with an image of Spock on it, hanging over her dorm bed for 2 years, yeah I'm with you on the fan girl page. My nerd quotient just jumped 100 points by simple association. "Hollywood hunk and new daddy Matt Damon is reportedly set to become the new Captain Kirk in the latest blockbuster 'Star Trek' flick. According to published reports, the film is to be directed by 'Mission Impossible''s JJ Abrams, who is desperate for Matt to get the part. William Shatner, who played the original Kirk in the long running television series has apparently given his seal of approval to the casting of Damon." "In more Shatner news, the Starship Enterprise captain is set to brazenly travel where only the strongest have survived, as the Comedy Central's newest Roastee." Melissa, Maybe next year we can find a campground outside of Riverside, Iowa and schedule our vacation to coincide with Spookapalooza...................AHHHHHHHH! (I promise to macrame a muzzle for my 15 year old this time) Why are so many young people leaving Iowa, when it has so much culture to share? I don't know what to say. I'll refrain from teasing.